A team of young and enthusiastic workers wielding chainsaws and herbicide have descended upon the Coastal Bend region to help destroy invasive plant species leaving blue dunes in their wake. The blue is actually temporary dye in herbicide that allows the crew to increase their precision and see what invasive plants they’ve already tackled. The team is a part of the American Conservation Experience (ACE) that provides young adults interested in resource management with experience in habitat restoration. The ACE team’s service is provided free of charge to the local region through a grant secured by The Nature Conservancy from the RESTORE Act which is funded through penalties from the Deepwater Horizon spill. Port Aransas has benefited with invasive species projects in the Port Aransas Nature Preserve, Nueces County Parks, and at The University of Texas Marine Science Institute. This past week the team was primarily tackling invasive Guinea Grass on dunes at The University of Texas Marine Science Institute and later this month they’ll head to the Port Aransas Nature Preserve with chainsaws in hand to tackle, among other species, the ever-pervasive Brazilian Pepper Tree. 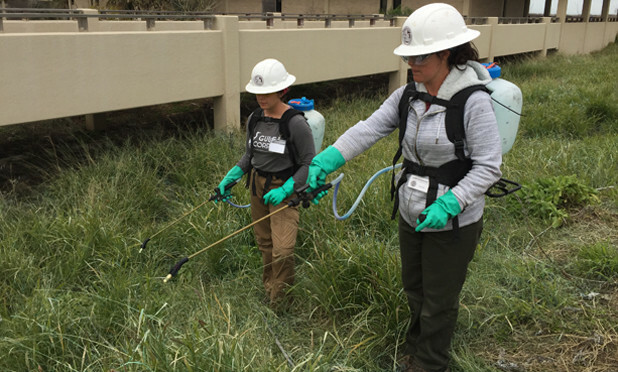 “We are very fortunate to have the ACE invasive strike team help us maintain healthy coastal prairie habitats,” said City of Port Aransas Nature Preserve Manager, Colleen Simpson. “As we continue to recover from Hurricane Harvey, the team couldn’t have come at a better time,” echoed Stewardship Coordinator Katie Swanson at the Mission-Aransas Reserve and University of Texas. While the team may be painting the dunes blue, it’s a silver lining to this community.